Few would have expected Portugal v Ukraine ending with the Zbirna earning a result in Portugal, the side who won the European Championships in 2016. The reigning champions were held to a goalless draw in Lisbon in what was an exciting fixture on Matchday 1 in Group B.
Portugal were awarded 18 corners to Ukraine’s two. Dyego Sousa earned his first senior appearance for Portugal. Brazilian-born Júnior Moraes made his first international debut for his adoptive Ukraine. The champions of Europe began their title defence on Friday where they hosted Ukraine. Despite maintaining the majority of possession, vastly outnumbering their opponents with corners earned, shots on goal and completed passes, and essentially outplaying the travelling side, the spoils were shared in what was an entertaining 0-0 draw. As expected, Portugal dictated the flow of the game. The Navigators welcomed the return of their captain Cristiano Ronaldo, who had been on hiatus following their match against Uruguay at the 2018 FIFA World Cup last summer, and it was he who gave life to an emphatic Portuguese start. 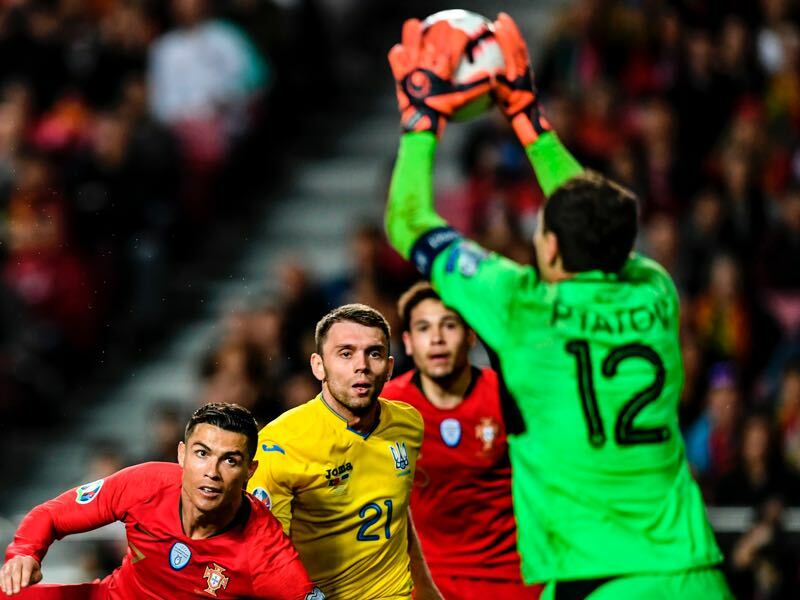 The Navigators thought they had an opportunity inside the first two minutes of the match when João Moutinho released André Silva in a one-on-one situation with Ukrainian goalkeeper Andriy Pyatov. Silva, however, was flagged for offside. The second chance of the match came in the 16’ following a Portuguese corner. Despite eliminating the initial danger, Ukraine failed to clear their lines. Center back Pepe collected the loose ball and shot on goal, but Pyatov expertly saved again. The subsequent corner in the 17’ saw William Carvalho score, but the midfielder was flagged for offside. Captain Ronaldo then tested Pyatov in the 24’ and 28’, yet somehow the goalkeeper saved both attempts, keeping his side alive in the match. Despite a cagey affair for the remaining portion of the half, Portugal were unable to find a breakthrough, and the match ended goalless at half time. Following the restart, Silva threatened Pyatov’s goal in the 51’. Pepe delivered an excellent cross into the box, where Ronaldo chested the ball into the path of Silva, but Pyatov collected the shot with ease. It was Silva’s shot in the 57’, however, which would be the talking point of the match. The striker would find space at the top of Ukraine’s box, firing the ball toward the top right-hand corner of the Ukrainian goal. Pyatov palmed the shot away, however, keeping the score level. Ukraine then had their first threat on goal in the 61’ as they sprung a counter from a Portuguese corner. Yevhen Konoplyanka led the charge, who found an unmarked Oleksandr Zinchenko. Zinchenko then passed the ball to Roman Yarmechuk, but as Yarmechuk delivered the ball into the Portuguese box, he was left disappointed as there was no one in support. Ukrainian hearts sank in the 68’ as a frustrated Konoplyanka fouled Ronaldo on the edge of the Ukrainian box, but the free kick was delivered harmlessly high and wide by Raphaël Guerreiro. It would be Ukraine, however, who would nearly steal the show. During the 86’ Ukraine led another counter-attack. After losing his marker, Konoplyanka fired toward goal, and Portuguese goalkeeper Rui Patrício spilt the rebound. Brazilian-born Júnior Moraes, who came on as a substitute for Yaremchuk, then attempted to fire the rebound home, yet somehow Portuguese defender Rúben Dias beat Moraes to the ball, resulting in a corner for Ukraine. The match then ended 0-0 at full time. Portugal were the stronger of the two sides, but a strongly composed Ukrainian side held the home side at bay. All things considered, both sides will be happy with a goalless draw and will now prepare for their respective matches in Group B.
Portugal will face Serbia on Matchday 2 in Group B. Serbia recently faced Germany in an international friendly which ended in a 1-1 draw. Meanwhile, Ukraine will travel to Luxembourg on Matchday 2. Luxembourg recently shocked Lithuania in their opening European qualifier, and the small European state will look to repeat the spoils as they host Ukraine on Monday. Since the retirement of Oleksandr Shovkovskiy in 2012, Andriy Pyatov has been Ukraine’s starting goalkeeper. Pyatov has had his fair share of howlers throughout his career, where he particularly came under a lot of criticism during the European Championships in 2016. Nonetheless, the match against Portugal was one of Pyatov’s best performances in goal since Ukraine’s prolific victory over France in Kyiv in November 2013. The Ukrainian goalkeeper kept the likes of Cristiano Ronaldo, William Carvalho and André Silva at bay, and made six important saves throughout the match. Without his heroics, Portugal surely would have run rampant over this young Ukrainian side. Pyatov’s performance in goal earned his side a vital point in Lisbon in what will be a difficult group. Portugal began the second half of the match much like the first. The Navigators were constantly threatening Ukraine’s goal, yet nothing came to fruition. Portugal thought they finally had the breakthrough in the 57’ when they forced Ukraine into their defensive third. After a passage of play, an unmarked André Silva found himself unmarked at the top of the Ukrainian box. The Portuguese striker sent a curling effort toward the top right-hand corner of the goal, yet Ukrainian goalkeeper Andriy Pyatov made a remarkable save, keeping his side in the match. Portugal maintained 59% possession and had 18 shots on goals. Ukraine, meanwhile, recorded 41% possession and only had six shots throughout the entire match. Portugal will host their second Euro 2020 qualifier in Group B against Serbia. Ukraine will travel to Luxembourg on Matchday 2 in Group B.